Coming up we’ll hear a fascinating interview with Chris Powell of the Gold Anti-Trust Action Committee. Chris gives perhaps the most thorough explanation of why governments are so intent on manipulating the precious metals markets and reveals some very interesting recent data about what they’ve quietly been doing. 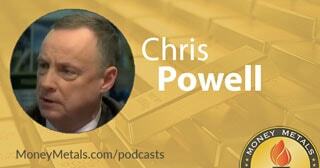 Don’t miss conversation with Chris Powell of GATA, coming up after this week’s market update. Well, while the American people have been focused on the dramatic and emotionally charged Kavanaugh confirmation battle, the Federal Reserve took actions which exerted some pressure on gold and silver markets this week. Following the FOMC’s announcement of another rate hike and Fed chair Jerome Powell’s upbeat remarks on the economy, precious metals markets sold off. They are rallying a bit here today. For the week, gold prices are lower by 0.05% as spot prices currently settle at $1,194 an ounce. Silver trades at $14.74 this week, up 2.9% thanks in large part to a rally today. On Wednesday, the Federal Reserve opted to raise its benchmark interest rate another quarter point. Though widely expected, the move still drew ire from some traders and Fed critics. And there is no more prominent Fed critic than the President of the United States. In off the cuff remarks to reporters, President Donald Trump said he was “not happy” with the Federal Reserve Board’s ongoing rate hikes. Donald Trump: So, we are doing great as a country. Unfortunately, they just raised interest rates a little bit because we are doing so well. I'm not happy about that because I know it's going to be a question. I am not happy about that. I'd rather pay down debt or do other things, create more jobs. So, I'm worried about the fact that they seem to like raising interest rates. Trump may talk about “paying down debt,” but that is something Congress has shown no political will to get done. In fact, the latest bipartisan deal to avert a government shutdown accelerates the federal government’s march toward trillion dollar deficits. Earlier this week the House of Representatives passed an $853 billion spending bill that fiscal conservatives derided as bloated and wasteful. Democrats supported the bill because it increases spending on bureaucracies including the Departments of Education, Labor, and Health and Human Services. Republicans got behind it because it boosted spending on military and veterans programs. That’s how bipartisanship works in Washington. D.C. Big Government forces on both sides of the aisle come together to give the deep state and the military-industrial complex everything they want and more. Meanwhile, ordinary Americans get stuck with mounting future liabilities as the deficits grow. Outgoing House Speaker Paul Ryan can congratulate himself for putting together a spending deal by and for Washington insiders once last time before the 2018 mid-term elections. It’s hard to see how it will inspire rank and file Republican voters to get out to vote to keep the House majority, though. House Freedom Caucus members who want to “drain the swamp” are getting completely shut down by GOP leadership. So are millions of pro-Trump voters who want funding for a border wall. Paul Ryan and company couldn’t come up with any funds for a wall, but they did make sure to keep federal dollars flowing into the coffers of Planned Parenthood on behalf of Democrats. All this spending is adding up to higher deficits. Through August, the federal deficit for the fiscal year came in at an eye popping $898 billion. That’s up from $674 billion over the same period last year. In the next fiscal year, the Congressional Budget Office forecasts the deficit will hit $1 trillion. Democrats can try to blame the Trump tax cuts for the nation’s deteriorating fiscal outlook, but federal revenues haven’t actually suffered. Treasury Department data show federal revenues are coming in slightly higher this year. The problem is that spending growth is outpacing revenue growth. It’s a problem that will carry an increasing financial burden as interest rates rise. Interest on the national debt is the fastest growing category in the federal budget. Interest payments alone are projected to surge to $390 billion next year. And within a decade, some $900 billion in interest could come due in a single year – outstripping spending on any other program. So yes, President Trump is right to be concerned about rising interest rates. He has no direct ability to set interest rate policy, though. Even the Fed can’t stop long-term rates from rising if the bond markets gets nervous about the growing long-term risks of default and inflation. What Trump can do is pull out his veto pen. For whatever reason, he’s been reluctant to use it – preferring to sign spending bills that he himself admits are bad deals for America. Trump should have learned by now that asking Congress to do better next time is futile. Career politicians won’t change their ways unless and until their budget-busting spending bills are sent back to them with a veto.